The strategic relation with Russia will retain India's centrality in 2017. 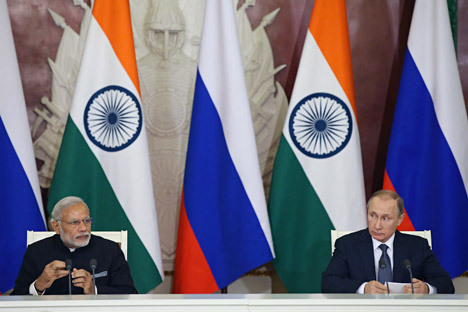 The strategic relation with Russia will retain India's centrality this year. In spite of confusion and apprehensions in the Indian minds about Moscow's overtures in New Delhi's troubled neighbourhood, the strategic partnership with the Russian Federation will retain its centrality in 2017 as the world plunges into a totally new search for the post-Cold War global equilibrium following the overt weakening of the United States as the world's sole super power and uncertainties over the incoming Trump administration's declared policy of making America "Great Again". Thanks to the leadership of Prime Minister Narendra Modi and President Vladimir Putin the annual summit in Goa in October rejuvenated the derailed "special privileged" partnership and put it back on the track leaving aside the misperceptions and overreaction over Moscow's engagement with Islamabad, which were overblown under the pressure of domestic constituency in the wake of Uri attack in Kashmir. Now Moscow's flexible approach towards Taliban role in the post-US withdrawal dispensation in Afghanistan and its joint efforts with Pakistan and China are seen as "unfriendly and anti-India" steps by New Delhi. There are open calls in the social media to 'punish' cash strapped Russia by scrapping the US$ 10 billion defence deals signed during President Putin's visit and India joining US-led Western sanctions, incidentally all the main Russian officials and companies involved in military-technical cooperation with India are under US and EU sanctions. Critics of Prime Minister Narendra Modi's foreign tours for allegedly failing to attract a single penny in foreign investments, prefer to ignore single largest foreign direct investment of US$ 13 billion by Rosneft in India, a company of "cash strapped" Russia. It is not a secret that a powerful pro-US lobby in India has for years been creating anti-Russia sentiments to justify closer defence ties with Washington, which itself is a major military aid provider and arms supplier to Pakistan. Incidentally, our efforts to patch up with the US and enthusiasm over President Obama's Asia pivot in hope of countering rising China, were used by Islamabad to lobby its interest in Moscow, which coincided with downgrading of our diplomatic representation in Russia in 2008, when after two successive political appointees (former retired foreign secretaries) a serving diplomat was appointed Indian ambassador. Over the years, the highly institutionalised bilateral mechanism of interaction seems to have lost its effectiveness and needs an overhaul, at least we can say this about the political dialogue at the foreign ministry level, which had allowed both the nations a freedom of action in their relations with third countries, but at the same time keeping each other's sensitivities in mind. Present irritants in relations are the fallout of these slippages and folly of taking Russia for granted. Instead of indulging in blame game, we need to focus on the areas where our long term interests overlap or coincide, because whatever would the configuration of the tomorrow's world, Russia will remain India's key foreign policy partner for the reasons having direct bearing on its vital national interests in the spheres of defence, energy security including civil nuclear and geostrategy. They require a next step in strategic partnership for further strengthening the bilateral relations to meet the common challenges in the long-term perspective. Defence: The present state of bi-lateral interaction in this field is called military-technical cooperation, virtually arms trade and development of weapon systems according to the buyers requirements. Today there is a need to upgrade it to the level of "Defence strategic" cooperation, which involves a closer interaction of the armed forces of the two countries beyond the routine war games, but also exchange of experts and opinions on military doctrines and strategic visions of the military-political leadership of the two countries. For example, hardly anybody is aware of the Russian Maritime Doctrine adopted in 2015, which provides for Russian Federation Navy's closest cooperation with the Indian Navy. It would be advisable to adopt the 2+2 mechanism of interaction of defence and foreign ministers of Russia and India (along the lines Moscow had with the US and France before the sanctions) for the better understanding for each other's strategic concerns and approaches. Probably, this understanding is reflected in the joint statement adopted at the Goa summit in which the leaders of India and Russia have agreed to convene Indo-Russian military industrial conference and create a high level bilateral Science & Technology Committee likely to be headed by the national security advisors of the two nations. The Indo-Russian Military industrial Conference will address military equipment related issues including spares, repair and maintenance of Russian supplied equipment and co-production under Make in India initiative. The Bilateral Science & Technology Committee would focus on matters relating to R&D collaboration in such high-tech sensitive areas as IT, communication, cyber security, outer space etc. Energy Security: Russia, which has already built two nuclear reactors in Tamil Nadu and is to build four more, remains so far the only foreign nation involved in tangible civil nuclear energy cooperation with India. US$ 13 billion ESSAR-Rosneft deal is much more than a business deal, because it will radically change the pattern of India's oil imports by ending dependency on volatile West Asia. Not only this, the heavy investments in the Russian hydrocarbons assets by the public sector corporations, further consolidates India's energy security. From the geostrategic perspective also long-term Indian and Russian interests coincide in a stable and peaceful Afghanistan not posing any threat to the stability of secular regimes in Central Asia , so they do also coincide in the freedom of shipping in South China Sea and respect for UNCLOS, as both Russian and Indian commercial shipping pass through it. Russia's latest foreign policy doctrine signed by President Vladimir Putin on December 1, 2016 states: Russia is committed to further strengthening its special privileged partnership with the Republic of India based on the convergence of foreign policy priorities, historical friendship and deep mutual trust, as well as enhancing mutually beneficial bilateral ties in all areas, primarily in trade and economy, with a focus on implementing long-term cooperation programmes approved by the two countries. This charts the course of bilateral strategic partnership between India and Russia in 2017, when the two countries will be marking the 70th anniversary of the establishment of diplomatic relations between the two nations.